While the world watches the nerve-racking matches being played inside, our eyes are completely dazed by what's going on outside the Mineirão stadium. This 1965 soccer stadium in Belo Horizonte was recently equipped with a whopping 6,000 solar panels on its roof just in time for the international competition. 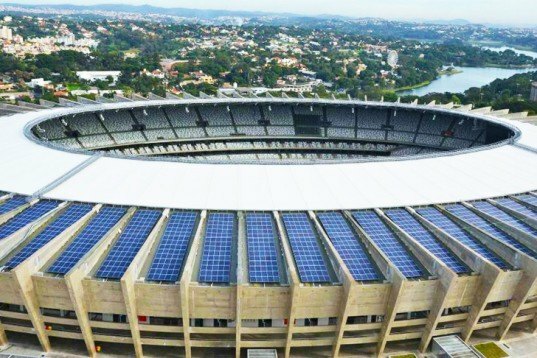 An initiative by local electricity company CEMIG, this is the first ever World Cup stadium completely powered by the sun. Originally built in 1965, the public listed Estádio Governador Magalhães Pinto is one of this year’s World Cup venues. Topped with 6,000 rooftop solar panels, it doubles as a complete photovoltaic solar plant (USF) capable of supplying power to 1,200 households. The plant was built by the Minas Gerais State Electricity Company (CEMIG), in partnership with German bank kfW and Minas Arena, the group that manages the Mineirão. Because the panels produce more energy than is necessary to power the stadium (1,600 megawatts-hour per year), 10 percent of the remaining power goes directly to regular consumers. 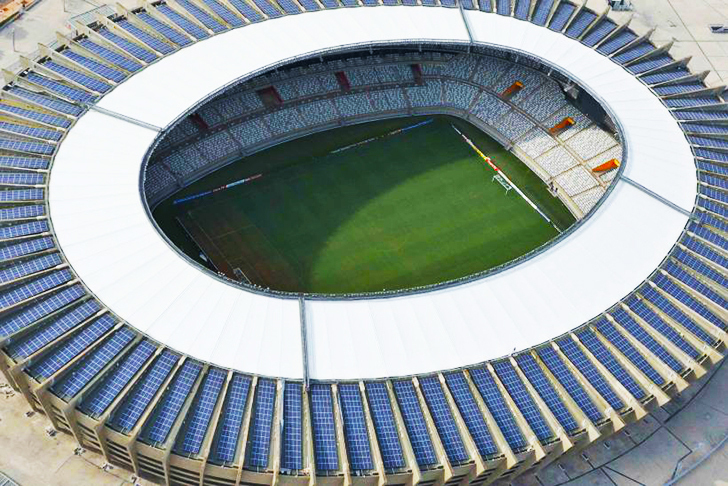 Although the Mineirão is the First World Cup stadium completely supplied by solar power, is not the first one in the world. This idea takes inspiration from Germany’s Freiburg and Switzerland’s Bern stadium, which also works thanks to the brightest star. Originally built in 1965, the public listed Estádio Governador Magalhães Pinto is one of this year's World Cup venues. Topped with 6,000 solar panels, it doubles as a complete photovoltaic solar plant (USF) capable of supplying power to 1,200 households. The plant was built by the Minas Gerais State Electricity Company (CEMIG), in partnership with German bank kfW and Minas Arena, the group that manages the Mineirão. Because this initiative produces more energy that it needs to power the stadium, 10 percent of the remaining power will go directly to regular consumers. Although the Mineirão is the First World Cup stadium completely supplied by solar power, is not the first stadium to be so equipped. This idea takes inspiration from Germany's Freiburg and Switzerland's Bern stadium.